It’s fluffy it’s squishy it’s light and it’s FUN! This amazingly versatile clay never dries out. 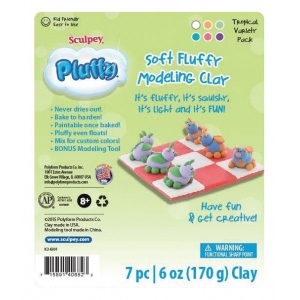 * PLUFFY is lightweight but thick pieces bake hard so that they won’t crack or break even in larger pieces. * Thinner baked pieces are durable and flexible. 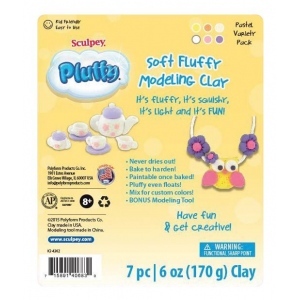 * Once baked PLUFFY can be painted with 100% acrylic paints and after baking PLUFFY even floats! 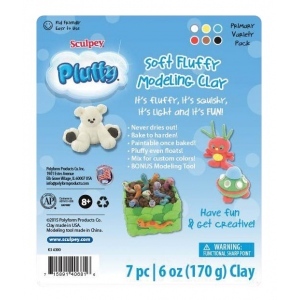 Sculpey Pluffy Primary Variety Pack contains: (6) 1 oz. assorted primary Pluffy blocks and (1) BONUS modeling tool.